Stylish and versatile, this adjustable swivel barstool comes in handsome black faux leather seat with lattice-pattern stitching. Give your kitchen or bar area a modern upgrade with this adjustable swivel barstool. The seat is covered in black faux leather with lattice stitching, and the base and triangular footrest have a sleek silver finish. A handsome contemporary look for your home. Adjusts from 35 1/2" to 41 1/2" high. Seat is 18" wide x 17" deep x adjusts from 25" to 31" high. Weighs 18 lbs. Contemporary adjustable swivel barstool from Studio 55D. Black faux leather with lattice stitching. Silver finish over metal base and triangular footrest. Base is 19 1/2" wide in diameter. Tapers to 12" in back. Do they come in white? BEST ANSWER: White is not an available option in this collection. 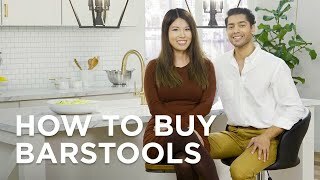 Do the stools tip easily or are they sturdy? BEST ANSWER: The stools are very sturdy and will not tip we've had ours a few months without any problems, we would purchase them again.